Woody is what kind of dog? Hardy: We don’t know. He’s some cattle dog, cross Labrador thing. I found him with Jessica Chastain. We were in Atlanta, Georgia, doing Lawless, and he was in the motorway. We almost ran him over with a Prius. Imagine running him over with a Prius, of all things. [Laughs.] What would be worse: to be run over, or to be run over by a Prius? You know what I mean? [Laughs.] And he ran off into the motorway, and Jess was like, “No, no, no! 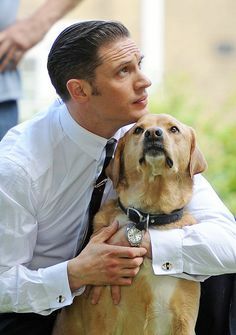 You’ve got to go after him!” He was only 11 weeks old, and so we got hold of him and he became the on-set dog, and Jessica’s mom looked after him for me for about six months while he cleared quarantine, and then we brought him back to London, so he’s my dog now. He goes on all my film sets now. He’s a great on-set dog.